Please note that Carter Subaru no longer services Saab. Carter Subaru Ballard is Washington State's premier Subaru dealer servicing Seattle, Bainbridge Island WA, Bellevue, Tacoma WA, and Tukwila WA. Our Factory Authorized Subaru technicians specialize in maintenance and repair of all Subaru models, including the Outback, Legacy, Forester, Impreza, WRX and Crosstrek. Our expert Subaru repair and service specialists are here to get your Subaru maintenance needs met quickly and economically. Each month at Carter Subaru Shoreline we offer Subaru Service Specials, special discount coupons for Seattle Subaru owners to print and save on your parts department visit. Stop by during our convenient service department hours or call us to make an appointment at our Seattle, Washington Subaru dealership. Carter Subaru Ballard offers a state-of-the-art service facility and comfortable waiting area. 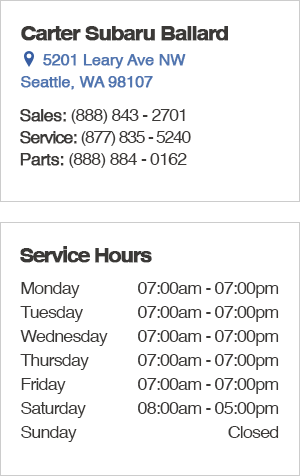 You can also fill out our Service Appointment Form to the right. Use the service appointment form to schedule your maintenance or repair visit from the convenience of your computer. Carter Subaru is proud to be serving Seattle, Bainbridge Island WA, Bellevue, Tacoma WA, Tukwila, WA and beyond! Have a new or used car, truck, or SUV that needs servicing and it's not a Subaru? Not a problem! We offer auto repair for all kinds of vehicles, using genuine manufacturer's auto parts. We know people drive all kinds of cars around the Seattle area, so whether it's convertibles, hybrid cars, or a standard sedan, Carter Subaru Ballard has you covered. If you have questions about our car service, give us a call any time at 877-835-5240. Our expert staff is happy to answer any inquiry you might have. Or you can always stop in and chat with us! We're confident we have the best staff around. Let us prove it to you.